Simply put, soil is the mixing of parent rock with organic matter. The rock weathers to create small and large fragments. This is done either by Physical Weathering, e.g. frost action and water abrasion, or by Chemical Weathering, e.g. dissolving action by carbon dioxide in water and oxidation. The rock in turn can receive a covering of organic matter, e.g. leaves and animal matter. 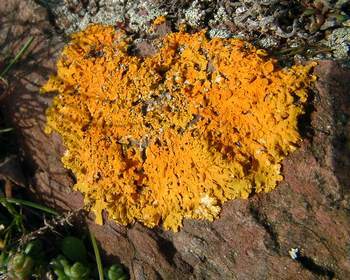 It may come from plants like lichens which attach themselves to the rock surface. The diagram below tries to show what happens over time. The top layer of organic matter slowly rotting and decomposing into smaller fragments and beginning to mix with the fragments of rock which are weathering from below. Over many hundreds of years the soil forms to create three distinct layer sor horizons. These are known as the A Horizon (primarily organic material), the C Horizon (the parent rock) and B Horizon ,the mixture layer in between. 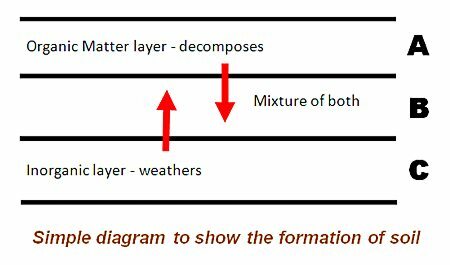 The latter are the all important organisms which promote the decomposition, movement and mixing of the layers. Part of this flora will be bacteria and fungi that complete the decomposition process to generate humus. This dark, sticky material determines the rich quality of the soil and is predominant in the B Horizon. Texture is important and determines the pore-space, which in turn, influences the proportion of air and water present. For example, sand is a coarse inorganic material which produces large air spaces such that water will quickly drain through the soil. This may carry away many of the nutrients of the soil, a process called leaching. Clay particles are much finer creating very small pores and so drainage is poor with minimal leaching. A mixture of particle sizes will producer a better quality soil called loam. To classify the soil types one needs to look at the structure of the layers and so a section through the soil must be dug, called a profile. Below are several examples. One of the clearest examples of seeing the layering is on sandy ground where leaching is most likely. 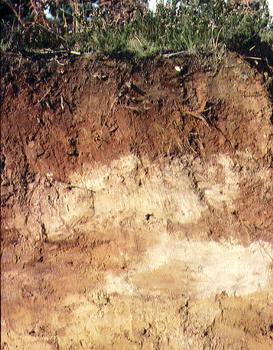 This soil type is called a podsolwhere the leaching creates an acidic pH. 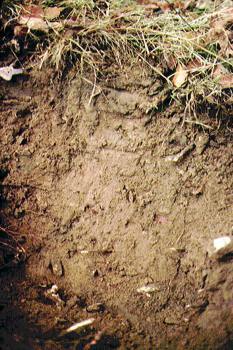 A brown earth soil is common in deciduous woodlands and is typically neutral whilst a rendzina is found on chalk, an alkaline soil. Iron Pan exposed by a river (image above). 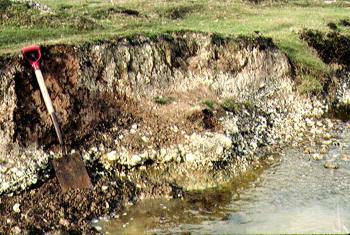 The profile has been cut by the river and the “shelf-like” hard layer along the base of the section, on which the spade is standing, is the exposed iron pan. This profile shows less of a layering and is typical of deciduous woodland.